As you may have seen from some of our social media posts, our Spanish school in Valencia has moved! Now situated in a gorgeous building in Valencia’s Casco Antiguo, the school – one of our most popular destinations for adults and juniors alike – couldn’t miss the opportunity to celebrate all its hard work. Staff invited agents and teachers from across the world to come and see the new building, take some pictures, and share anecdotes over some delicious Mediterranean food. 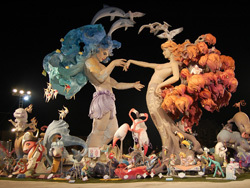 If you are interested in cultural festivals in other countries, the lively and colourful spring festival Las Fallas (Valencian: Las Falles) in the Spanish city of Valencia should be on the top of your list. You will be delighted by this spectacle and it will give you a unique insight into the Valencian culture! The festival, which is also known as Las Falles de San José (The Falles of Saint Joseph) was even declared a UNESCO Intangible Cultural Heritage of Humanity in 2016. The locals celebrate this festival every year in March with the main festivities taking place between the 15th and 19th of March. 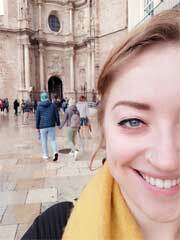 Below is a guest blog from Renée about her time studying in Valencia. 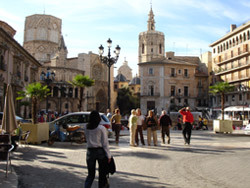 Valencia is an enchanting city with lots to do, but also has a safe small-town feeling. It was one of the reasons why I decided to study there! Another reason is that they speak with the ‘real’ Spanish accent, which is great when you are practicing the language. Valencia has two universities and is very near to a beautiful sandy beach. Anyone familiar with Valencia will know that the city has some amazing attractions. You could spend several days exploring the futuristic buildings of the City of Arts and Sciences, the beach is stunning with miles of golden sand and who wouldn’t enjoy the simple pleasure of enjoying a coffee as you watch the world go by in the sunny Plaza de la Virgen. What you may not be so familiar with is Valencia’s amazing zoo. This zoological wonder was opened in 2008, and is built in the gardens created from the bed of the old River Turia. To simply call this attraction a zoo is really an unfair description, and in my opinion, doesn’t do justice to the either the animal or visitor experience. 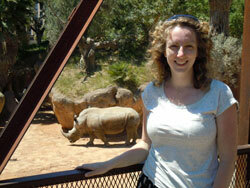 The ‘zoo’ is in fact a state of the art ‘bioparc’, advertised as being the most advanced in Europe. Valencia – Fiesta de Disfraces! I’m doing a Spanish course in Valencia and really loving it! One of the great things about the course is that, as well as the lessons, the school organizes lots of lots of activities – excursions, guided walks, dance lessons and LOADS more! They really help you settle in and make friends. 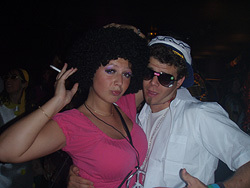 Last weekend the school organized a “Fiesta de Disfraces” (“Costume Party”) in a bar near our school. The theme was ‘the seventies’. As announced on the notice boards in school, all the students had a free entry and received a free drink if they wore a costume. Thanks to that strategy, there were LOTS of students in costumes, creating a really great atmosphere of ‘the seventies’ in the bar. My stay in Valencia has been a fantastic experience at all levels. 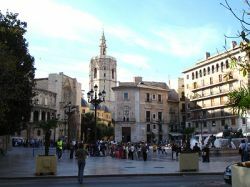 For me, Valencia has been the perfect city in which to combine studying, cultural enrichment and a GREAT quality of life! The climate is agreeable all year, helping you feel good. Also (perhaps because of the climate) the Valencians are very pleasant, happy and dynamic. I have really enjoyed taking advantage of the offerings of such a big city (the culture, spare time and going out) and the other aspects of Valencia like the beach (enormous, with kilometres of soft golden sand!) and the nature. It has truly been an incredible experience for me. The 5km of the old river have been transformed into a garden in which you can walk, study, skate or practice sports – everything is possible. What impressed me most of all is that all this can be enjoyed in a coastal location, with a wonderful beach and a short time after the ski season has finished!!! Ok, so imagine attending a school in the heart of a beautiful historic city… that’s also home to ‘space age’ architectural design…and two magnificent beaches. It almost seems too good to be true, but hear it from me – in Valencia you have the best of everything! I think that being a student in Valencia is perfect, as there is a really young feel to this city – full of life, laughter and at present the pride and thrills of being host to the 32nd Americas Cup. I also think that studying in Valencia would appeal to anybody and everybody, as Valencia seems to break all the rules as it manages to perfectly cater to a whole range of different tastes.